For the last six years, a song has been bouncing round my brain, though never really tripping off my tongue. It was taught to me (Will) in a pub in London by Mercury nominated singer Sam Lee (www.samleesong.co.uk), and it’s about a disaster that happened at Hartlake Bridge in Kent, on October 20th 1853. 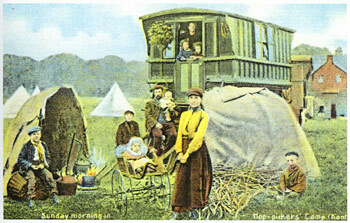 In heavy rain, thirty-seven hop-pickers were travelling to their lodgings by horse and cart. The River Medway was swollen and the land flooded. Halfway across the bridge, a horse got scared, and kicked out. The bridge railings smashed, the cart fell in the river, and everyone drowned. 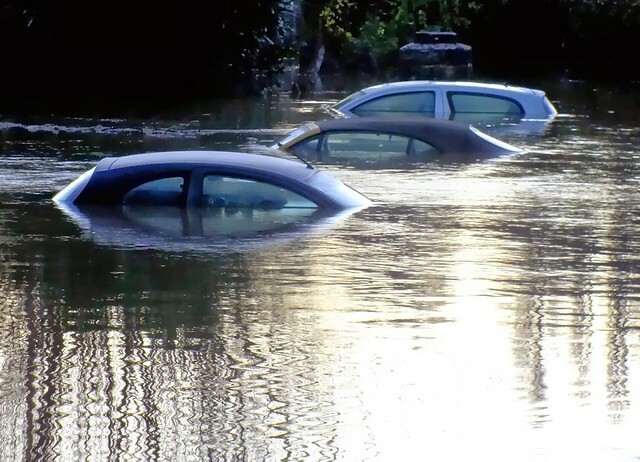 Witnesses could only poke at the eddying flood-waters with long poles, hoping for the thud of bodies. One man lost 14 members of his family, and a little girl lost her father, mother and infant brother. The national press swiftly descended to this bleak scene, dubbing it: “The Hartlake Bridge Tragedy”. You should have heard the screams of all those poor souls, as they were going down. You still can hear the screams of all those poor souls, as they are going down. That’s where the laid all those poor souls, after they were drowned. Hartlake Bridge borrows its melody from an older air. The tune can seem incongruously jaunty at times, but if the mode feels alien to ideas of proper mournfulness, we are outsiders to its musical background, for this song is Romany in origin. The majority of the drowned hop-pickers were travelling folk, and their memory was kept alive for 161 years mostly within Gypsy musical communities. It’s only with singers like A.L. Lloyd of the last great British folk revival, and the rise of the Internet, that the Hartlake Bridge song has returned to mainstream British culture. Songs are like that – it’s hard to get rid of them, especially among traveller communities. While Gorgias (non-travellers) often forgot their ancestral ditties in exchange for national hymnals and radio pop, the Gypsies kept singing the old songs. As soon as I heard Hartlake Bridge sung, the song entwined me like the wolfish grip of a hop-bine. For seven years I picked hops near Faversham, each morning travelling to the fields on a rickety trailer pulled by pre-war tractor. Things have not changed so much since 1853. The same East End families have worked on this farm for nearly a century, three generations in the hop-garden at any one time. 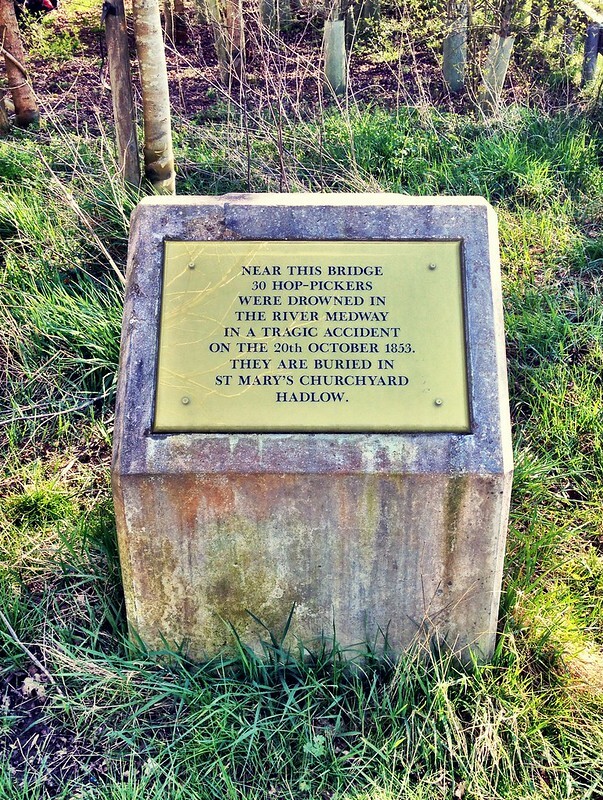 But it was not until this winter, browsing maps at home, that I noticed Hartlake Bridge astride the River Medway, barely 100 kilometres from my home. The song landed, became real, and I found myself singing. So this spring, when the rains stopped, I walked to Hartlake Bridge with a chap named Guy, our intention to carry this song back to its source. Song collectors happily pull songs from their localities, to pickle them in London museums, but we feel this practise is incomplete. It is time to take the music back home, to re-activate the circuit of land and song. Who knows what could happen if we sing the right song – at the right time – in the right place? 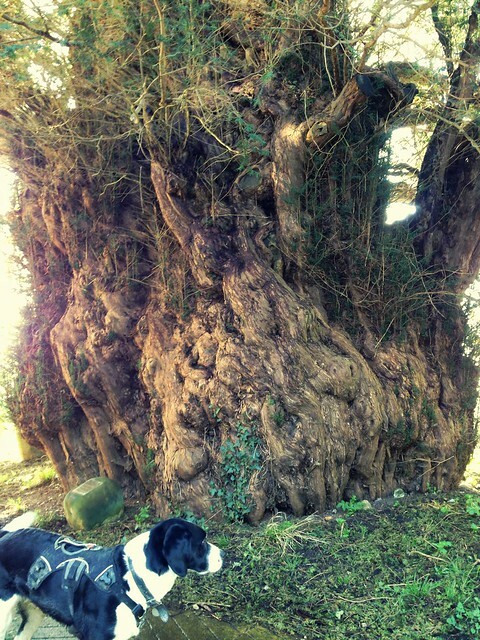 Calling our walk ‘pilgrimage’ was immediately troublesome. The word is obscure to modern ears, conjuring confused images of Chaucerian Pardoners, or heavy barefoot penance. 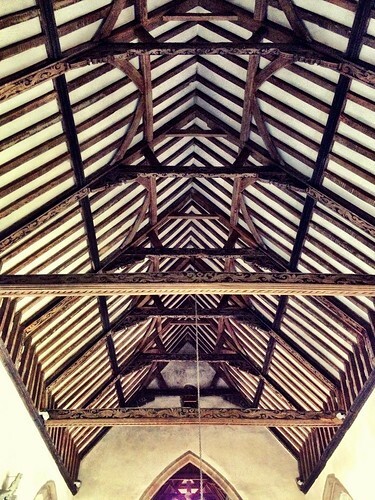 But medieval English pilgrimage was a high holiday, notoriously full of song. 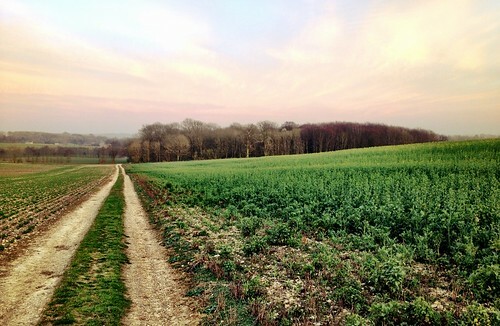 And pilgrimage routes are ever being re-formed, from Emperor Constantine’s mother Helena discovering the ‘real’ Cross of Jesus (known as the ‘Invention’ of the Cross), to Beckett’s cult of miracles at Canterbury, all the way on to Belloc’s twentieth century re-discovery of ‘The Pilgrims’ Way’. So why, we asked, can we not make our own pilgrimage routes today? We can and did. 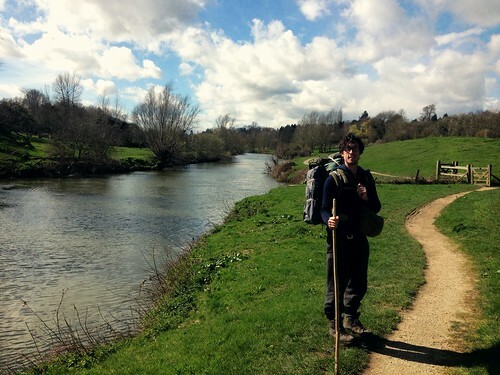 From Elham in Kent we roamed toward Hartlake bridge near Tonbridge. All I knew was the song, and Guy and I had never sung together before. The nightly camp-fire was our school and the blending of vox our harmonic goal. The rest we left to the whim of journey. We had no idea how much we had to learn. In 1853, Hartlake Bridge was half-submerged by heavy flooding. In 2014 it was flooded again. Only two days before us Prince Charles had visited Yalding village, five miles from Hartlake, to raise awareness of recent flood damage. Today the bridge is newly built and safe. But Hartlake Bridge in 1853 was notoriously dangerous. Local farmers knew this and many avoided it. 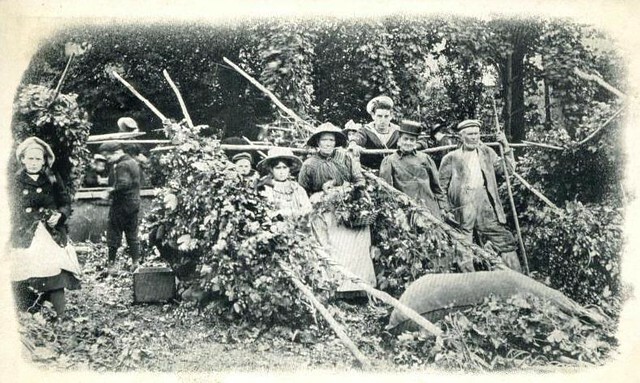 So perhaps the hop-pickers fate was no accident? Yes, the horses kicked at the wooden railings, but they only broke because they were rotten. If anyone was respsonsible, it was the Medway Navigation Company, a highly profitable organisation established by Parliament in 1740 to oversee the transport of goods on the Medway river. Contemporary Kent and Sussex road-networks were notoriously under-developed, so waterways were the fastest and most reliable routes for commerce and trade. Everything moved on the water, and as controllers of this sole supply route, the Navigation Company were on a winner. But though it improved the waterway for big business, MNC had a reputation for neglecting the needs of the poor. Rather than building a tow-path for barges, which would enable them to be pulled by horses, the MNC was happy for this work to be done by people known as ‘Huffers’, who would climb hedges and ditches for twelve hour stretches, dragging behind them forty-ton barges laden with coal. And the Company leveed a harsh system of fines to curb the colourful cursing and swearing that was cultivated by this competitive sub-class of boat draggers. Bridge safety was the MNC’s core mandate, but because they did not upkeep Hartlake Bridge, thirty-seven lives were lost. But perhaps unsurprisingly, the public inquest held at the Bell Inn of Golden Green (also table-top morgue for the corpses) absolved the Company of any liability. The hoppers’ deaths were labelled ‘accidental’. The Medway Navigation Company, formed by the Mayor of Tonbridge and wealthy with its coal monopoly, was hardly going to pay compensation to Gypsies. That is how things rolled back then. 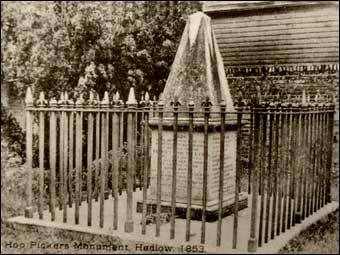 Money for the funeral was raised by public subscription, and a small memorial built in a shady corner behind Hadlow Church. 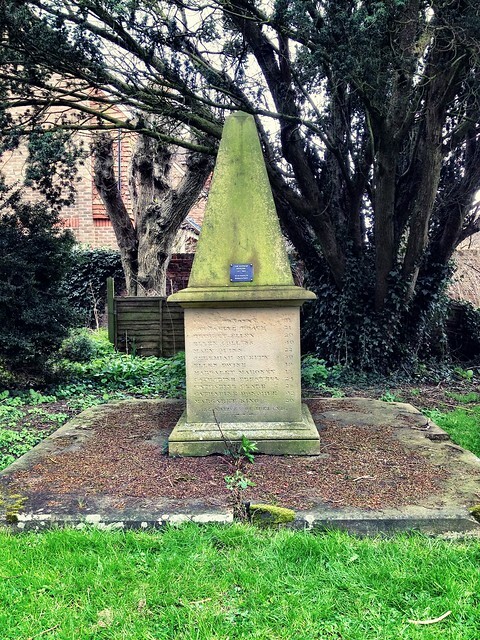 This memorial is about 3 foot high, ambitiously described as resembling an oast house. 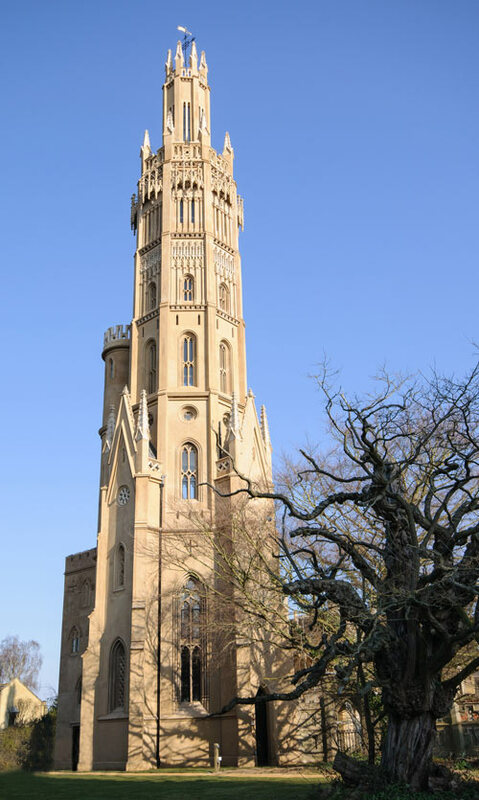 In rich contrast, barely fifty metres away stands the Hadlow tower, the tallest folly in the UK.This ultimate ostentation was built – locals whisper as though such gossip were still controversial – to enable divorced landowner Walter May to see through his ex-wife’s bedroom at Goldhill House. Known as ‘May’s Folly’, it was paid for by the highly speculative but extremely profitable business of…growing hops. The Medway Navigation Company folded in 1910, when railways were kings of transport and the rise of the motor car and tarmac roadway was well underway. Today, only white plastic leisure boats cruise the Medway, like ghostly floating running shoes. On their decks reclining young ladies appear ill-at-ease, as though aware of how ridiculous it is to emulate Biarritz in muddy old Kent. But that’s another story. 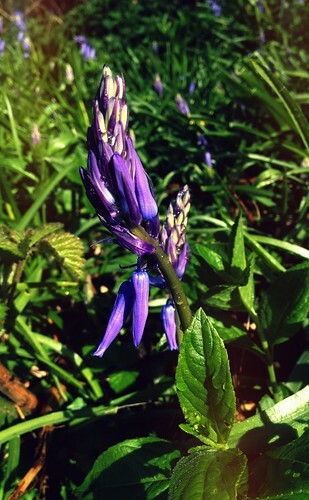 The Kentish spring is ideal for journey-making. We grazed young hawthorn leaves, gorse flowers, wild garlic, nettles and ground elder. We cut two hazel walking staffs from a single bough, classic props to keep our backs upright, gauge the depth of floodwaters and accumulate journey mana. Our water was pulled from springs and streams. Churches and Public Houses were our support teams. Skylarks sang our daily progress, and the moon rose nightly to our songs and fire. To everyone we met, we sang the song of Hartlake Bridge. In musical exchange, we received a moving lullaby from an ex-Methodist minister in Wye, and Medway shanties from a bargeman in Maidstone. Meetings were frequent. At a church-warden’s house, we met the chairperson of the Kent Churches Trust, and scored a dip in a swimming pool. We met Justin Bieber/Morrissey lookalikes, a Burmese cat breeder and honey-seller, a cider-slumped man in a riverside tent, a bearded Elton John who tried to give us money, a pretty young railway crossing attendant, and various other interesting folk. We even met Barry from Eastenders walking beside the Medway, who told us he’d made a documentary on Kent’s last traditional working hop-farm at Rolveden, but the BBC shelved it. It was perfect to sing him the Hartlake Bridge song, though we were sketchy with lyrics, and his half-offer to get us on the evening news never materialised. Kent rarely seemed crowded. Everyone was busy driving somewhere, but on foot between the roads, you’re in forgotten England. Far from the driver’s dream of instant arrival, taking five days made us wish for twenty. But even with slowness, miles soon disappeared, and Hartlake Bridge approached. The first station of our pilgrimage was the hop-pickers’ memorial, in a shady corner behind Hadlow Churchyard. By beautiful co-incidence, at the memorial we met a descendent of the Taylor family, of whom three were lost in the tragedy. The Taylors came from Gypsy Corner in Acton. She told us that her mother had stopped calling herself a Gypsy, because of the distrust that greeted them each year when arriving to pick hops. Shops bound their window-goods behind mesh-wire, and pubs bore the legend ‘no hikers or hawkers’. She had never heard the Hartlake Bridge song before, so singing to her was a privilege, to return this song to its bloodline. We walked on aglow. But approaching Golden Green, we were forced into the hedge as a red sports-car roared and skidded before powering round the corner. As we stood in shock, a small boy on his tiny bicycle squeaked toward us. His father rode close behind, blank with fury and terror. The enormity of the Hartlake tragedy suddenly pressed upon us, with its dreadful loss of life, and Guy began to weep. At the Bell Inn, we sang outside but failed to challenge the status quo within. Even today, Hartlake Bridge is controversial. We offered this man the song, but he instantly and flatly refused. Not understanding the warning, we walked on. On a sunny day, it’s eerie under Hartlake Bridge. Graffiti stains the walls, and an ugly placard describes the tragedy in empty words. We tried to sing to a passing lady, but after the first verse her dog started eating poo through its muzzle, an astonishingly horrible sight. Then we tried to make a recording, with my phone and mini tripod. It went poorly, so we tried again. But our motivation had slipped from memorial, to become almost entirely vanity. Furthermore, I’d somehow persuaded myself to keep my walking staff, which I had planned to offer the river as tribute. I learned better. Setting up the tripod, a leg pinged away, sheared clean off. I stared amazed at the severed limb, potent as a tarot card, as at that same moment, Guy banged his head into a steel girder, though he knew exactly where it was. With mild panic, Guy stated the obvious: “We’ve outstayed our welcome”. Stepping into the sunshine, I fling my staff, and Guy places his gently, in the flow of the Medway, shrine of this pilgrimage. We watched the sticks disappear, and calmness returned. Back up on the bridge, at last we crossed over safely. Our final miles were walked to the destination those hop-pickers never reached, the village of Tudeley. For its church, Marc Chagall created in 1967 some of South England’s finest stained glass windows. 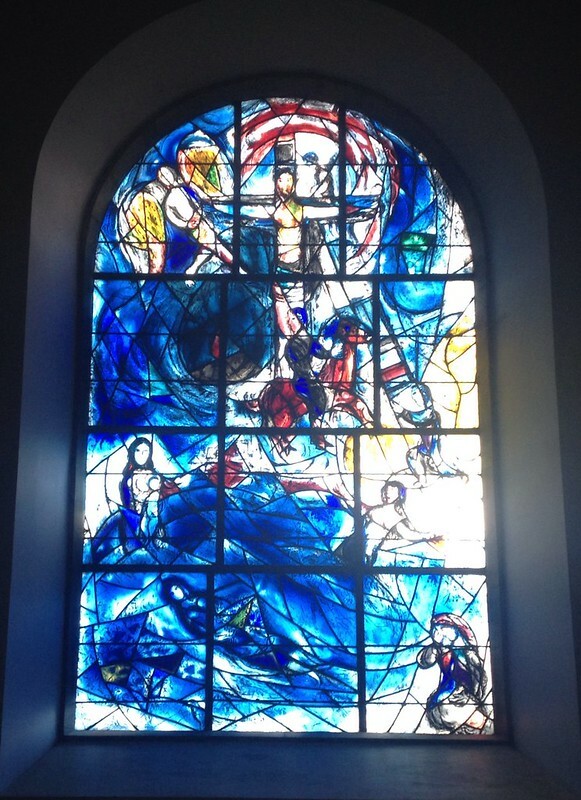 The main East window, we were amazed to see, depicts a body adrift in deep blue waters. These incredibly beautiful windows were commissioned in memory of yet another victim of drowning. Beneath this image of death and resurrection, we sang the song of Hartlake Bridge one final time, and so completed our pilgrimage. Thank-you for reading, watching and listening. Hello Guy and Will. I’d like to congratulate you on the songs and pilgrimages and the wonderfully written story of the terrible events of that day in 1853. My 5 x great grandmother, Sarah Taylor, her son Thomas and grandson Thomas all died that day, along with extended family totally 16. It’s wonderful that you are keeping the history of these families alive 163 years later. The Taylor family had already faced tragedy when they lost their father Jeremiah, Sarah’s Husband, while their youngest son of nine children was still a baby in arms in 1831. It goes to show their strength of character and determination, just like you both. Well done, ???? I loved this beautiful, moving account, and the layers of meaning and history entwined within it. Repatriation of songs to their roots in the land and in the past is a genius idea. You write so well about it too. Thank you for such an inspiring tale. A friend gave me your cd a couple of days ago and I’ve been listening to it ever since. I’d never heard of Hartlake Bridge until now. A shocking tale of corporate greed, made all the more powerful by music, and also by your beautiful photography and lyrical writing. Thank you. What a stunning and moving description of your pilgrimage to Hartlake Bridge Will! When is your book being published by the way? What a stunning and moving description of your pilgrimage to Hartlake Bridge Will! When is your book being published?